This piece was recently donated to The Maryland Coastal Bays Program, located at 8219 Stephan Decatur Highway, Berlin, Maryland. It depicts a crab getting caught in a plastic six pack holder and a cigarette but floating in the water, and is a reminder to us all to take care of our waterways, the beach, the bays and the rivers and creeks that connect us all. 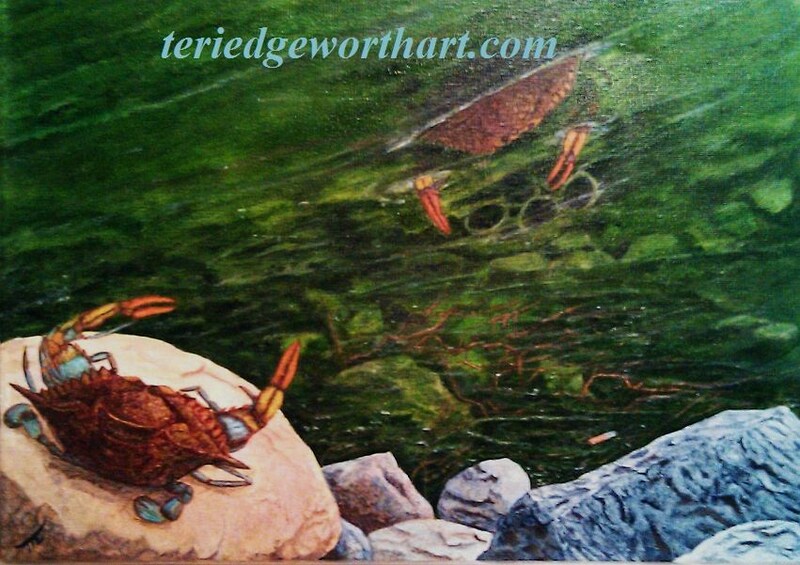 Mention this piece when ordering your next painting and Teri will give you the client a "crabby" discount on any purchase and she will also donate ten percent of the sale to help support the MDCP! Thank You for stopping by to view my artwork, browse, and feel free to contact me with any orders, commissions or questions. Enjoy, and have a great day!